The Barnes & Noble Nook Color steps into the big time today with the release of its 1.2 software update, which finally delivers apps, e-mail, and Web browsing to the versatile e-reader. With the Nook Color priced at $249 with no service contract, the added functionality is bound to catapult the device to the head of the bargain-tablet class. The update is available today for sideloading onto the Nook Color via the Nook Color Website; it will roll out as an over-the-air update via Wi-Fi in the coming weeks. The Nook Color is migrating to Android 2.2, now with support for Adobe Flash and AIR. Although the tablet retains the fully customized skin and interface that make it look not at all like Android, the update makes some critical changes to highlight the new capabilities. First off, the 'Extras' menu is renamed 'Apps'--which makes sense, given that the whole update is app-focused. Also, the Lend Me app merges into the new Nook Friends social app, which facilitates sharing passages via Facebook or Twitter, for example. B&N's app strategy is curated and targeted. You still won't have access to the Google Android Market or Google services. Instead, you'll buy apps via B&N's online bookstore. Apps can be books or other supplemental content, or favorites such as games and productivity tools. The company says that over 5000 developers have registered in the program, and just two weeks ago B&N deployed tools and services for the developers to submit their apps. Already the company has requests for submission of hundreds of apps; over 125 will be available at launch. 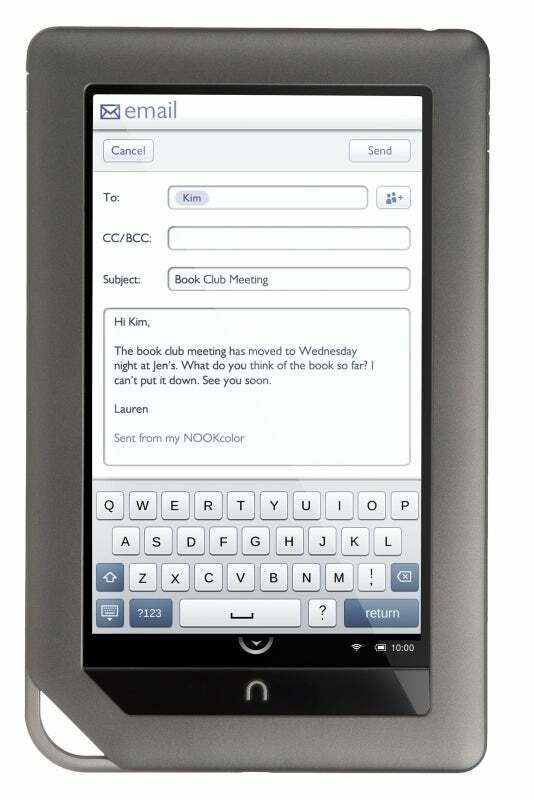 In adding apps as well as tablet features, B&N focused on the types of things that users requested. Games ranked high, as did education, reference, learning, and children's apps. (And, of course, POP3 e-mail and better Web browsing.) The apps are separated into sections, labeled Play, Organize, Learn, Explore, Lifestyle, News, and Kids. Among the big names are Angry Birds, Dr. Seuss, Epicurious, Lonely Planet (which starts with its Phrasebooks series), More Brain Exercises, My-Cast, Pulse, and Uno. In the new OS, users get e-mail, with presets for AOL Mail, Gmail, Hotmail, and Yahoo Mail already in place; no Exchange server support is built-in, but an app is available for that. Calendar and note-taking apps also come with the free update. These apps join the other stock offerings on the Nook Color, which include Chess, Contacts, Crossword Puzzle, Gallery, Pandora Internet Radio, and Sudoku apps. The new apps sold via the B&N storefront will range in price, with half the collection available at launch costing $3 or less. At the storefront, you can shop for apps separately--or, if the item you're looking for is a book app, you'll find it interspersed with e-book offerings. 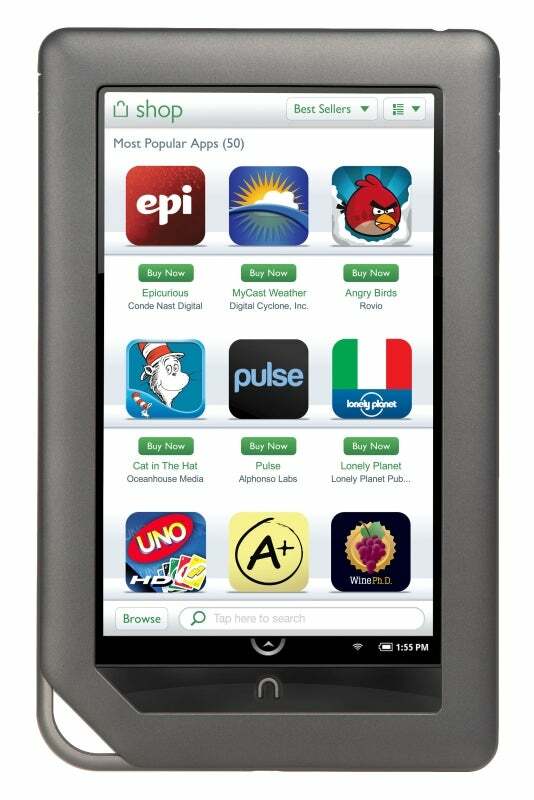 Buy an app in a single click, and it will download and install onto the Nook Color. Installed apps will be accessible via the Apps folder, but those apps that are interactive books will also end up in the Nook Color's library, and organized on shelves. On the Nook Color's home screen, app icons will behave just as book and periodical icons do today: They'll appear in the active shelf at the bottom, and you can pull them out to rest on the home screen itself. As with books, the most recent app items stack to the left, and scroll to the right. B&N says that part of its goal with its developer program is to make sure that apps are tailored for the Nook Color. "It is easy to port an app from Android to Nook Color," says Claudia Romanini, director of developer relations. "Our SDK is an extension of the standard Android SDK. Developers don't have to do much other than remove features not supported by our hardware (GPS, camera, telephony), and then rescale the app in terms of font sizes and graphics, to make sure it works on our display." In addition to the big app news, B&N is rolling out some enhancements to its periodical reader, including adding a navigation slider bar in the carousel to help you better find your place in the magazine, and widening the landscape column of the article view. Magazines remain popular among Nook Color users: B&N has sold over 1 million digital periodical subscription orders and single copies via the Nook Color. The Nook Color isn't the most versatile tablet out there today, but this update will certainly extend the device's usefulness--and it will help to transform the face of the low-end tablet market, too. 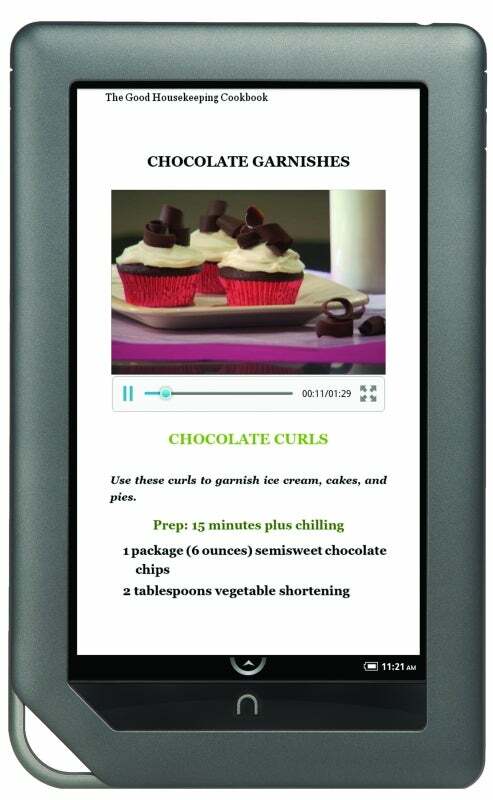 The Nook Color packs a Texas Instruments ARM Cortex-A8 800MHz processor, 8GB of internal memory, and a 1024-by-600-pixel display that's optimized to minimize glare and provide sharp text for reading; it also has a MicroSDHC card slot for up 32GB of additional storage. With those specs, the Nook Color is no powerhouse, and the lack of full app functionality and Google services may be a drawback for some people. Nevertheless, the comparatively sweet $249 price and the optimized reading screen make the Nook Color a better deal than ever.